ARLINGTON, Texas -- Ryan Fitzpatrick and the New York Jets are keeping the pressure on Pittsburgh and Kansas City in the race for two wild-card spots in the AFC. Randy Bullock kicked a 40-yard field goal with 36 seconds left and the Jets moved a half-game ahead of the Steelers and Chiefs with a 19-16 victory over the Dallas Cowboys on Saturday night. Fitzpatrick's 43-yard pass to Kenbrell Thompkins put the Jets (9-5) in position for a win. Kellen Moore replaced an ineffective Matt Cassel at quarterback and gave the Cowboys (4-10) a spark, but it wasn't enough to keep the defending NFC East champions from being eliminated with two games remaining. Eric Decker caught a 3-yard scoring pass to set a franchise record with Brandon Marshall with 21 combined touchdowns receiving as the Jets won their fourth straight for the first time since 2010. Fitzpatrick threw his first interception since Nov. 22 to give the Cowboys a field goal and a 13-9 lead in the third quarter, but came back to direct a 70-yard drive to Decker's score. Decker and Marshall broke the franchise mark of 20 combined TDs that they shared with Art Powell-Don Maynard (1960) and Al Toon-Wesley Walker (1986). Dan Bailey tied it at 16 on a 50-yard field goal that caromed through off the right upright with 1:55 remaining. Moore got the tying drive by sneaking a pass behind Buster Skrine for a 23-yard gain to Cole Beasley. The last chance for the Cowboys ended on Moore's third interception when his desperation heave for Dez Bryant went over the outstretched arm of the All-Pro receiver and was caught by Marcus Williams. The Cowboys had four interceptions overall. Cassel was replaced after two bumbling plays in the first half. On the first, he stumbled trying to change directions after faking a throw and threw to blindly to a spot where Darrelle Revis was by himself for the easy interception. Cassel came out the series after taking a 19-yard sack, which wasn't long after he left the field to loud boos following a three-and-out. Moore's second pass was intercepted Marcus Gilchrist before he beat a New York blitz by slinging the ball in the flat to Bryant, who got around Revis for the touchdown and a 10-9 lead. 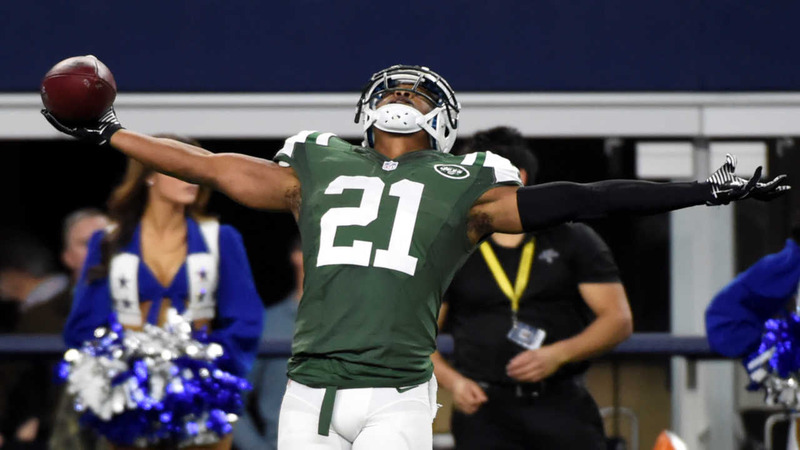 Moore had a chance to add to that lead but threw his second interception to Calvin Pryor in the end zone in the third quarter, shortly before Fitzpatrick threw it directly to Terrance Mitchell. It was the first interception by a Dallas cornerback this season, and came from a seventh-round pick from last year who was signed to the practice squad and activated this week after a hamstring injury sidelined Morris Claiborne. New York's first touchdown came after a near-fumble by Decker when the receiver's left leg turned awkwardly and he dropped the ball just as he knee was hitting the turf. He left the game briefly with a knee injury. The Cowboys challenged the ruling that he was down, but it was upheld on review. Two plays later, Bilal Powell scored easily on a 12-yard run.